Worldplay, Inc. was established on October 26, 2005 by director/producer Hilari Scarl as an independent production company specializing in film, television and theatre. Worldplay, Inc.'s first endeavor was the WORLDPLAY documentary, a multinational theatre project narrated by Sharon Stone that brought together young people from conflict-ridden areas around the world. The international casts collaborated on original theatre projects based on their lives and issues. Hilari Scarl was accepted into the prestigious and competitive Sundance Producers Conference with the project. A feature documentary, NORTHERN IRELAND NOW grew out of the WORLDPLAY project. The film follows youth from three divided communities in Northern Ireland as they are brought together through a theatre project, fostering tolerance, communication and understanding. NORTHERN IRELAND NOW worked with over 50 teenagers who founded their own theatre program across city lines as a result of the project. Worldplay, Inc. co-produced the family drama NO ORDINARY HERO starring John Maucere featuring Academy-Award winner Marlee Matlin that won awards at film festivals and is available on Amazon and Netflix. 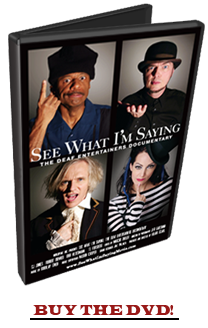 SIGN WITH ROBERT: EDUCATIONAL SIGN LANGUAGE AND DEAF CULTURE SERIES was created and produced by Worldplay, Inc. featuring Deaf actor/educator Robert DeMayo. This 30-episode series provides over 15 hours of fun and interactive learning applauded by Deaf educators and is available to download, stream or view on DVD. Hilari has produced TV shows for CBS, The History Channel, FOX, TLC and Court TV. She directed/produced over 12 short films in two years, including the short documentary PAVING THE WAY which was a finalist for International Documentary Challenge, played the film festival circuit and was acquired by Current TV. Her narrative short SNIPS & SNAILS is a horror spoof that she directed, co-wrote and co-produced with Gary Anthony Williams. The film won the Audience Award at the Dances With Films festival and became a cult classic at film festivals around the world. 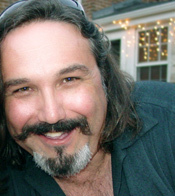 Jeff Gatesman is an award-winning cinematographer known for feature length films and documentaries as well as television commercials. His career started in Chicago as a cameraman on The Oprah Winfrey Show, Entertainment Tonight and True Stories of the Highway Patrol. Jeff worked as a cinematographer on the award-winning feature films SEE WHAT I’M SAYING, AMAZONAS and NO ORDINARY HERO and the short film PASSPORT that premiered at Slamdance. Jeff earned a BA in film production from Columbia College and studied photography at the prestigious Film and TV Academy of Performing Arts in Prague, CZ. Skills include the full range of High Definition Cameras, digital imaging technology, 3D camera rigs and stereography, DSLR HD cameras, 16mm and 35mm film cameras, developing workflows for shooting under harsh and limiting conditions, creating his own LED lighting systems and working with a multitude of camera platforms including smart cranes, sliders, gyroscopic stabilizers and drone platforms. He is skilled in Photoshop, Premiere, After Effects and DaVinci. Gatesman is licensed by the FAA as an airman for aerial drone photography and a member of the International Cinematographers Guild and the American Photographic Artists. Notable accolades include two Telly Awards, a Gold Aurora Award (AMAZONAS) and was a nominee in the Photography Masters Cup International Color Awards and received an Honorable Mention from the Advertising Photographers of America for his feature WHIRLING DERVISH. THOMAS G. MILLER has worked on documentaries and in public television for the past fifteen years. 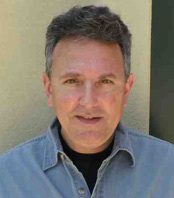 He associate produced the Sundance award-winning film Licensed To Kill (POV-PBS), and co-produced and edited Fender Philosophers (PBS) and the feature documentary Camp Out (MTV-Logo). He has also edited the feature documentary films, Rock the Boat (HBO), Good Kurds, Bad Kurds (Independent Lens-PBS), and Home of the Brave (Sundance, Court TV). He just completed directing, producing, co-writing and co-editing the feature documentary, ONE BAD CAT: The Reverend Albert Wagner Story. Other credits include producing television films for Discovery, and WNET’s series on disabilities, People in Motion. Tom is also on the board of the International Documentary Association, a member of the Academy of Television Arts & Sciences and the Writers Guild, and has been teaching documentary filmmaking and editing at the USC School of Cinematic Arts for six years. He is also a pediatrician and has served as medical consultant for Sesame Street and other film and television series. He graduated with a BS degree in zoology from The University of Michigan, an MD from the Medical College of Ohio and an MFA from the USC School of Cinematic Arts. 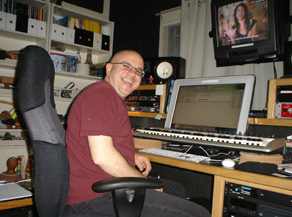 Marcus has edited at DreamWorks Studios on big budget feature films including FLUSHED AWAY, MADAGASCAR, SHARK TALE, SINBAD, THE PRINCE OF EGYPT, AN AMERICAN TAIL: FIEVEL GOES WEST. A native of the U.K., Marcus first started working on television documentaries and dramas in Manchester. After working on a number of BBC, Granada TV and independent programs, he moved to Cosgrove Hall productions to work on various award-winning TV animation series such as DANGERMOUSE , COUNT DUCKULA and THE RELUCTANT DRAGON, which won the BAFTA TV Award for Best Short Animated Film. Marcus' association with Steven Spielberg's Amblimation company and DreamWorks has lasted over 17 years. 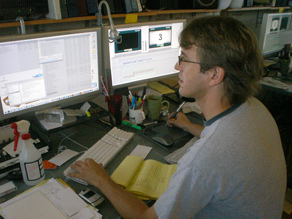 During his time in London, he moved into features and saw the change from film to AVID-based editing. Embracing this new direction, Marcus was involved in the AVID USERS GROUP in London and wrote articles for their trade publication. His latest credits include SHREK: THE HALLS (a Christmas TV special), Jerry Seinfeld's BEE MOVIE and the short film FIRST FLIGHT. He was lead editor on FIRST FLIGHT (produced by DreamWorks Animation), which won the Montgomery Prize - Certificate of Excellence at Chicago's International Children's Film Festival and was nominated for first prize at the Montreal World Film Festival. He also has worked with Simon Wells, the director of THE TIME MACHINE, on creating storyboard animatics for that movie. Marcus edited DUCK, the live action feature film starring Philip Baker Hall (ZODIAC/BRUCE ALMIGHTY/MAGNOLIA) which opened in August 2007. DUCK won the Audience Award at Cinequest and won Best Foreign Dramatic Feature at the European Independent Film Festival. Morgan R. Stiff graduated from the University of Southern California, School of Cinema-Television, with an MFA in Film Production in 2005 after receiving her BFA from New York University in Dramatic Writing in 2002. 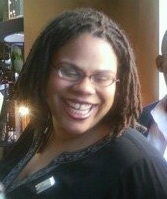 As a producer, Morgan has produced fiction and documentary films, as well as promotional videos. Producing projects include Porcelain (2004), which is currently being distributed by Iron Rod Motion Pictures, Inc.; Hip Hop Homos (LOGO Networks, 2004); and the award winning films Brooklyn’s Bridge to Jordan (Showtime, LOGO, BET J, 2005) and Mississippi Damned (2009). 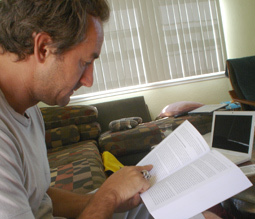 As an editor, Morgan has worked on tributes, music videos, fiction films, and documentaries. Editing projects include Hope’s Choice (Showtime, 2004), the award winning documentary, One Bad Cat: The Reverend Albert Wagner Story (Ovation TV, 2009), and Mississippi Damned. Morgan is the Chief Productions Officer of Morgan's Mark a independent production company dedicated to taking stories from the margins and introducing them to the mainstream. Munich-born, composer Kubilay Uner has bounced around the planet and through every musical genre, which explains a thing or two about his individual approach to music. With eight feature film scores, two TV pilots and a number of concert music works, Kubi is as comfortable in the concert hall as he is on the dubbing stage. "Whether the music is part of a film or stands on its own, my goal is to deliver an intense experience that completely immerses and transforms the listener. I believe a good piece of music should take you on a journey." This idea was at the core of FILM2MUSIC, an international competition held at the 2007 Sundance Film Festival where Kubi invited filmmakers the world over to create a film to a track from his CINEMATIC score. Credits include collaborations with filmmakers Michael and Mark Polish, record productions for soul legend Bobby Womack and music for video art installations at LACMA and the Pasadena Museum of California Art. Kubi studied composition with Johannes Fritsch and Klarenz Barlow at the State Academy of Music in Cologne, Germany and with Luigi Nono at a Centre Acanthes workshop in France. He also studied with Mort Subotnick, Fredric Rzewski and James Newton at CalArts where he earned his Master's Degree in music. Kubi currently works as a freelance composer in Chicago where he serves as the director of the Music Composition and the Screen MFA program at Columbia College. 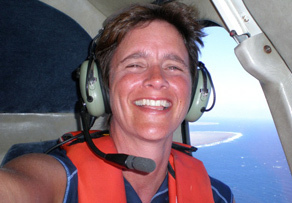 Lisa Leeman (writer, producer, director, editor), an Emmy-nominated filmmaker, has served as a judge at the Sundance Film Festival, as president of the International Documentary Association, and on the boards of the IDA and the National Coalition of Independent Public Broadcasting Producers. Honors include the once-in-a-lifetime American Film Institute's Independent Filmmaker Grant, the Western States Media Arts Fellowship, and the ITVS/PMN Station-Independent Partnership Program Grant. Recent directing credits include ONE LUCKY ELEPHANT (in production); OUT OF FAITH (PBS, winter '08); WHO NEEDS SLEEP (Sundance Film Festival, co-directed with Haskell Wexler). Writing credits include MADE IN L.A. (Silverdocs, POV/PBS), NAKED IN ASHES and NOT IN GOD'S NAME (featuring the Dalai Lama). Lisa's first film, METAMORPHOSIS: MAN INTO WOMAN, won the Filmmakers' Trophy upon its premiere at Sundance in 1990 and was broadcast on PBS on its celebrated series POV, where it earned the highest audience rating of any POV broadcast. It has won many awards and screened in festivals around the world, been broadcast in a dozen countries and is screened frequently in university classes. In 1997, Lisa received an Emmy nomination for FENDER PHILOSOPHERS, a portrait of Americans as seen through our bumper stickers. Lisa's comedic video diary BREAKING UP, which explores the heartbreak and humor at the end of romance, premiered on ARTE, Europe's noted arts and culture station. Other producing credits include CRAZY WISDOM (in production), MEDICAL DIARY (Discovery Health Network), INDEPENDENT EYE (KCET), APPRECIATING ART (FNN) and a documentary on the World Festival of Sacred Music. Lisa has consulted on documentaries for broadcasters (editorial and script consultant for the PBS series POV), and frequently consults with filmmakers on their documentaries, including BIG MAMA (Academy Award, Best Short Documentary, 2001 /HBO), LOST IN LA MANCHA (Berlin Film Festival; Quixote Films); HOME OF THE BRAVE (Paola Di Florio, Sundance, 2004); HOMELAND (Audience Award AFI Fest 2000); GOOD KURDS, BAD KURDS: NO FRIENDS BUT THE MOUNTAINS (Best Documentary, Atlanta Film Festival). Lisa is on the faculty of the University of Southern California School of Cinematic Arts, teaching advanced documentary production and editing, and has taught documentary workshops in China and Jordan. She has served as a Juror at the Sundance Film Festival, the Regional Student Academy Awards and the AFIFest, chaired the IDA Awards, was a documentary panelist at SXSW and sat on the POV Editorial Committee and KCET Arts Advisory Board. Born to deaf storytellers masquerading as parents, James is privileged to have been raised in the world SEE WHAT I'M SAYING so beautifully translates to the screen. He is grateful for the life-long support of the many Deaf entertainers who have mentored and guided him over the years, especially, Bernard Bragg, Linda Bove, Ed Waterstreet and Marlee Matlin. He gives special thanks to his countless professional mentors, many of whom also have Deaf parents, among them, Lou Fant, Joyce Linden, Sherry Hicks and Jack Jason. In 1990, James began his theatrical training and work as a sign language interpreter at the California State University at Northridge where he met and worked with many of the actors featured in this film. In 1993, he began his collaborative work with Deaf West Theatre, and in 1997 graduated to working with the National Theater of the Deaf in their highly regarded summer program which focused on training Deaf actors to perform on the stage. He is a certified member in good standing with both the Registry of Interpreters for the Deaf, (R.I.D.) and the National Association of the Deaf (N.A.D.). James specializes in entertainment, and has interpreted, performed and consulted on a wide variety of theater, television and film projects. He also specializes in court interpreting and has provided service in over 50 courthouses in the Greater Los Angeles area and beyond. James studied at the National Center on Deafness at CSUN and is grateful for the unfettered access to the priceless archives hidden in their library. He is also actively involved with the Greater Los Angeles Council on Deafness in its tireless efforts on behalf of the Deaf community. He would like to congratulate all the people he has worked with over the years and gives special thanks to Hilari Scarl for creating this long-awaited documentary; the entertainment world is better for it. Theatre credits include OF MICE AND MEN (1994), ROMEO AND JULIET (1998), STREETCAR NAMED DESIRE (2000), and CJ Jones' incredible one-man show WHAT ARE YOU, DEAF? (2005) produced by Deaf West Theater. 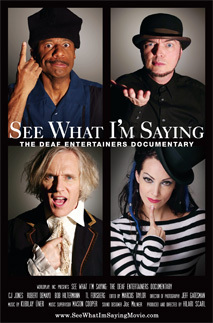 Derryn Grey has been working as a sign language interpreter since 1993. 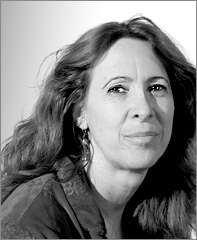 She interprets in legal, medical, corporate, video, educational, community and performance settings, and assisted in post production on the film.